Here’s something completely stupid: this carriageway is the Western Distributor passing over Kent, Day and Margaret Streets near Wynyard. Below it is…a bit of road that…goes nowhere, and does nothing. The Western Distributor began life in the early 1960s as a way to relieve traffic on the Harbour Bridge. Sydney’s extensive underground rail system meant that the Distributor couldn’t be built as a series of tunnels, so viaducts were the sensible alternative. That’s where the sense stopped. The only reason the Western Distributor existed was because the designers of the Harbour Bridge and existing road system didn’t use enough foresight. You’d think that planners of the WD would employ twice as much foresight to make sure that further modifications weren’t necessary. Well, two times nothing is still nothing. That’s it there, below that huge, multi-lane bridge. If you can’t see it, squint. The two-lane Glebe Island Bridge had been built in 1903 to provide access to the Glebe Abattoir, and it includes a swing bridge to allow boats through. Surprisingly, this bridge proved to be unable to handle the traffic spewing forth from the Western Distributor, and in 1984 the NSW Government proposed another bridge. Good thinking! 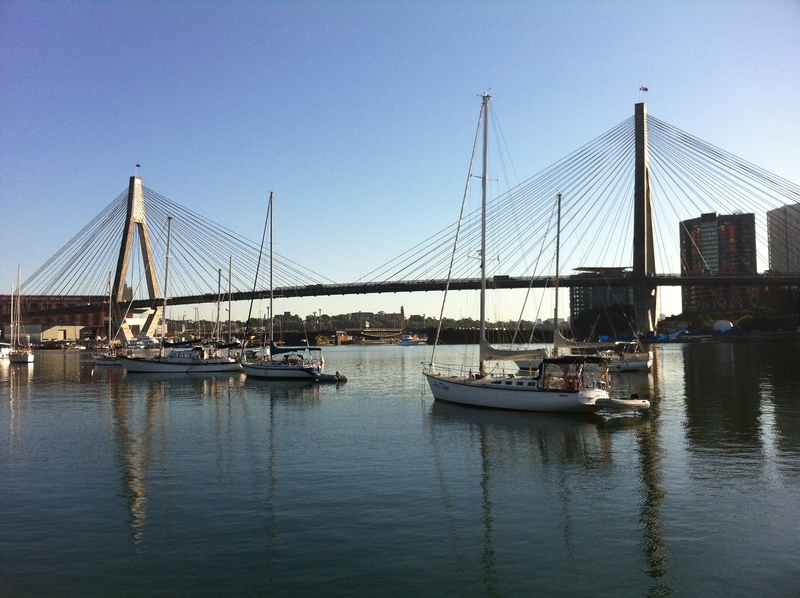 The Anzac Bridge was completed by 1995 (! ), and opened in December of that year. It features a great height to allow boats through. Of course, when the Distributor had been designed, it was flowing towards a small bridge. Now that it had a giant, capable bridge to lead into, the one-lane road itself suddenly seemed a bit lacklustre. In 2002 (!! ), work commenced to widen the Western Distributor throughout the city, which brings us back to our original ridiculousness. Here’s the other end, just in case you were thinking it went somewhere. 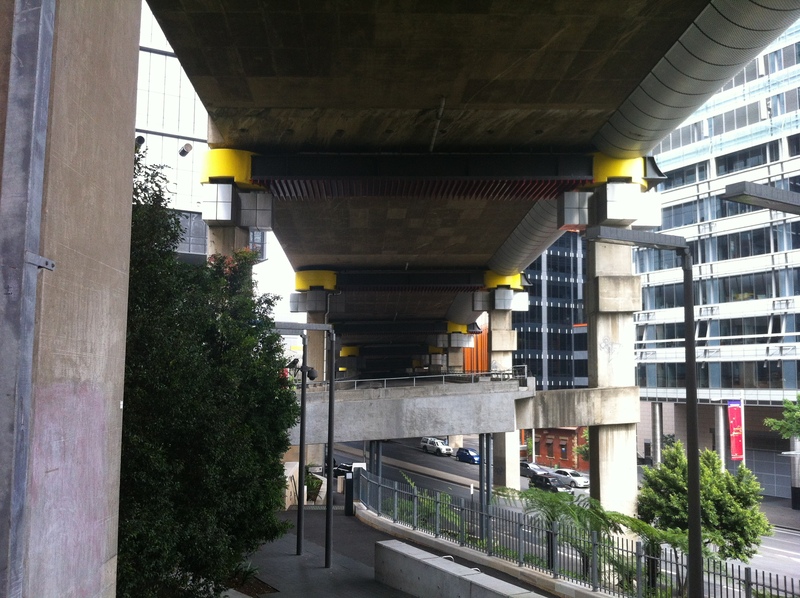 This bit of suspended road was originally an on-ramp for the Western Distributor, with access from Margaret Street. When the road above our piece here was widened, it claimed the on-ramp’s space and ended Margaret Street’s usefulness in the scheme of things. For a time it was used as a parking bay (illustrating the lengths the City of Sydney Council is willing to go to to make a buck out of parking). 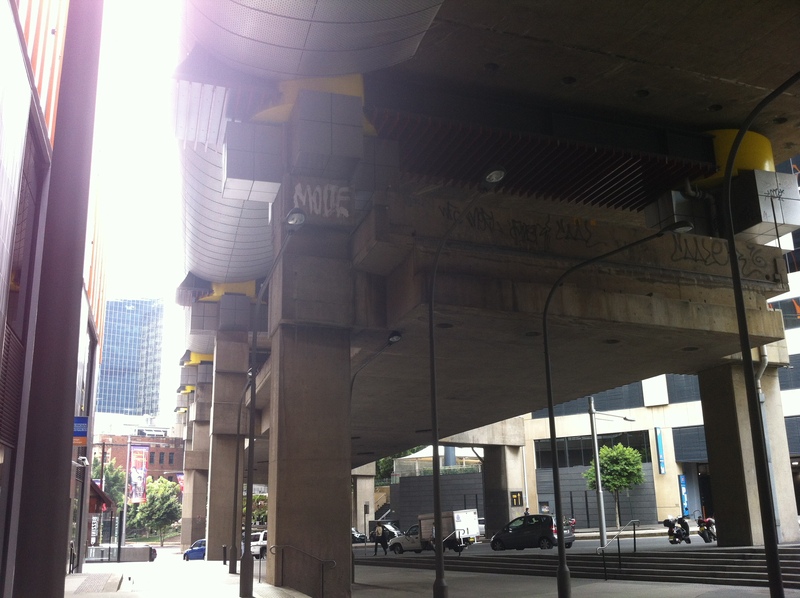 The ramp was then severed at both ends, and now sits hanging above the street, useless and surreal. The happy ending to this story is that after the implementation of each of these emergency patches to the highways of Sydney, traffic in the city was never a problem ever again. Thanks for the history of this piece of infrastructure. This ramp was a DMR asset and leased to a car parking 🅿 firm who sealed it with tar and then line marked parking spaces. I think it had 112 spaces and cost $12per day for early birds before 8am with access off Kent Street. I worked in the DMR property section when this happened.